I reconciled with cinnamon thanks to Rui, my lovely Japanese neighbor. I decided I didn’t like cinnamon after moving to the US, where cinnamon is used in almost every dessert. I think I had a cinnamon overdose and refused to eat anything where I could taste it. Rui, gave me half a loaf of bread she made even though she said it didn’t turn out very well and was embarrassed to give it to me. I gave her fresh yeast a few days earlier, and she used it making this bread. One thing I never told her is that I don’t eat cinnamon and that I have been on a cinnamon rebellion for years. Jamais de cannelle !!! So I politely took the bread and what else to do? since I am polite, I tasted it, even though you could smell cinnamon one kilometer away…I thought well, if I don’t like it, will I be lying and tell her, I love it, or be honest and say, I hate it? Tough call, what would you do? Polite or brutally honest? I was lucky, it was love at first bite! 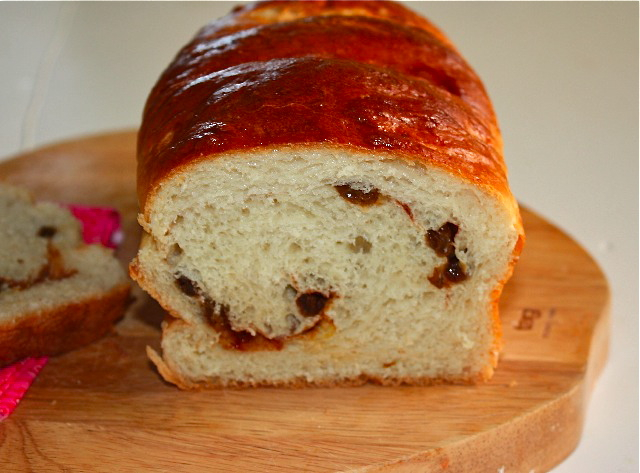 What a delicious, moist, and soft bread, a pure delight for breakfast with butter and jam. Then I thought “well, for someone who doesn’t like cinnamon, I did a pretty good job finishing it”. After that happy encounter with cinnamon, I decided to make my own bread…yes with cinnamon…actually, this bread is closer to a brioche than to what we French call bread. It has the ingredients and texture of a brioche. Now thinking about it, we do have a bread that is called “pain brioché” which is something in between a bread and a brioche, so talking about nuances and making people confused, yes the French are the masters of it. It’s faster to make than a bread or a brioche, you don’t have to prepare it the night before, so it’s a great recipe to have in hands. Essayer c’est l’adopter! To try it is to adopt it. Dissolve yeast in 1/3 of milk. In a recipient mix milk/yeast mixture, sugar and 1/5 of the flour, mix well and let it rest for about 1 hour. Add the rest of the ingredients (except raisins, cinnamon, 1 tbs sugar) and mix well, to form an elastic dough, knead the dough for about 15 minutes. Form a ball, and let rise for about 2 hours. Flatten the ball to form a rectangle, spread 1 tbs sugar raisins and cinnamon. Roll the dough and let it rise for another hour. Using a brush, spread some yolk on top. Cook in a pre-heated oven at 370F for about 45 minutes. This entry was posted by silvia on April 6, 2011 at 4:55 am, and is filed under Breads, Breakfast/Brunch. Follow any responses to this post through RSS 2.0.You can leave a response or trackback from your own site. Yeah, I remember you told me that you hated cinnamon so much! But now…. it has finally taken over you. You’re falling in love with it once more, aren’t you? ha… The bread looks really inviting and it’s brioche like bread. Hope you’re having a great day. Take care. 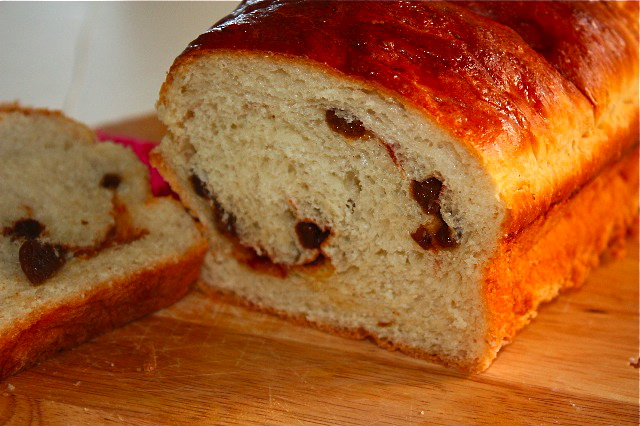 J’adore ce beau pain aux raisins. C’est vrai que les Américains raffolent un peu trop de la cannelle… C’est un peu le même principe au Canada… N’empêche, avec les raisins, ça a dü être excellent! This bread is so fluffy and gorgeous!! Yay to cinnamon! quelle belle recette. J’en mange tous les matins au petit dej et je chechais justement à en faire maison. Ta recette tombe bien. Merci merci. tu l’as très bien réussi!! Je ne pourrais pas vivre sans cannelle. Que j’aime cette épice. Même dans la sauce à spaghetti. Quel beau pain qui semble délicieux. Wow!! What a great looking loaf! That looks so good. Isn’t brioche just a really good bread? I love the recipe. Whatever you call this, it’s beautiful! Cinnamon is used in a lot of desserts here in the US, but I’m a big cinnamon fan. Bring it on! I do love baking bread. What a beautiful loaf..the crust looks perfect. Unlike you, I love cinnamon, so I’m sure I would love this! I can’t wait to give it a try. Your loaf looks perfect. Such a lovely crust. Thank you so much for sharing your words and creativity with me tonight. During good times and bad, your blog always offers me a dose of joy. I hope you have a blessed and happy Sunday, my friend. Hugs from Austin! I like cinnamon too and your bread looks scrumptious to me;-) I think I will have to stand in line to adopt it!